A small group of demonstrators stood on the steps of the Temple of Justice and in view of the Legislative Building as they advocated for more state spending on education prior to a hearing before the state Supreme Court. CHIMACUM, Wash. — Thomas Ahearne, a Seattle lawyer, drove in his Ford pickup to this small town on the Olympic Peninsula a decade ago on an audacious mission. He planned to sue the state for violating its “paramount” constitutional responsibility, amply funding education for every child. It was a long shot, but, if it worked, billions of dollars would flow, and the state’s 1 million schoolchildren would finally receive the education promised to them. One of the things Ahearne was hunting for in Chimacum was a brave soul willing to be the lawsuit’s public face. Stephanie McCleary, a shy mother of two children, soon volunteered. She hardly imagined her instinctive decision to help her kids would put her at the center of a battle against the state’s most powerful players, uncovering a trail of inequities and injustices that have profound implications for this state and the rest of the nation. The unlikely journey of Ahearne and McCleary began because Washington faced a startling crisis: Despite its image as the cutting-edge land of Microsoft, Boeing, Amazon, Starbucks, and many other corporate icons, the state ranks near last place nationally in education categories such as per-pupil funding, class size, and college attendance. So the odds facing Ahearne and McCleary seemed extreme. More than a battle for a better school in little Chimacum and smaller classes for McCleary’s children, it set in motion a chain of events that would lead the state’s Supreme Court justices to find the government in contempt of court and all but plead with the politicians to meet their obligations to schoolchildren. The clash would reverberate far behind Washington’s state lines. Here was a self-described progressive state with a Democratic governor and House, an electorate that last year voted to improve school funding, and many cash-flush corporations famished for qualified graduates. If a solution to gridlock couldn’t be found here, how could other states — or the other Washington, the nation’s capital — break out of their political stalemates? It is a battle that only now, a decade later, is near to reaching its surprising conclusion. But that is getting ahead of the story. But the case dragged on and the ruling never directly benefited Stephanie. Only later did she realize that her underfunded school had failed to give her the education she was legally entitled to. She lived in Sequim, a small farming town on the Olympic Peninsula. She graduated high school and went to college, but dropped out after a year. She worked as a waitress, a cashier at a car wash, a debt collector, and a secretary. McCleary eventually moved to nearby Chimacum and went to work as a human resources manager for the local school district, which is headquartered in a building that resembles a trailer. There she saw the inequities firsthand and worried how they would affect her children, Kelsey and Carter. Thomas Ahearne in his office in downtown Seattle. Textbooks are often out of date. Teachers are paid barely above the state minimum for educators. Advanced placement courses are in short supply. The school used class time for fund-raising projects to pay for basic supplies. Having concluded that her own education had been shortchanged, she didn’t want her children similarly penalized. So the stage was set when Ahearne, the Seattle lawyer, came to town in 2005 with his proposal that the local school district join his lawsuit against the state. Ahearne was new to the crusade — and to crusading, generally. A graduate of the University of Notre Dame and University of Chicago Law School, he had risen at a powerful Seattle firm partly by working for business clients who took on insurance companies, often winning claims of millions of dollars. His opponents gave him the nickname Nightmare because they dreaded seeing him in court. His friends called him Crash because of his love of motorcycle racing at speeds that reached 160 miles per hour, despite or maybe because of the risks. On two occasions, his crashes left him unconscious for a day. He proudly displayed the helmets worn in both accidents in his law office. Ahearne was looking for something more meaningful than fighting for one business against another when a colleague suggested he use his courtroom gifts to take on the state of Washington over education funding. This appealed to the idealist in him. “Education is what makes people equal,” he said. “You can say `all people are equal,’ but education is what makes them all equal.” Not incidentally, it also appealed to his competitive streak. “My primary motivator in all of this is, I just hate losing,” he said. He had to find a family willing to put their name on the suit, just as the Brown family of Topeka, Kan., had agreed in the 1950s to put their name on Brown v. Board of Education, which led to the desegregation of public schools. There were risks; such a family was bound to be both celebrated by education advocates but criticized by some who feared higher taxes. Stephanie McCleary seemed to Ahearne the ideal candidate, with two children who were both fine students. Kelsey was 13 by the time the suit was filed in 2007, and Carter was 7. Ahearne would long remember meeting Carter, how the young boy reached up to him to shake his hand. Surely, Ahearne figured, by the time Carter got to middle or high school, McCleary v. State of Washington would be over. Two years later, Stephanie McCleary drove from Chimacum, down the Olympic Peninsula to Bainbridge Island, and took the ferry to Seattle for her 2009 appearance in Superior Court. She was so nervous she could not stop shaking. Inside the courtroom, the state’s assistant attorney general greeted her with an unlikely line of questioning: Why had Kelsey missed 10 days of class in the first trimester of sixth grade? 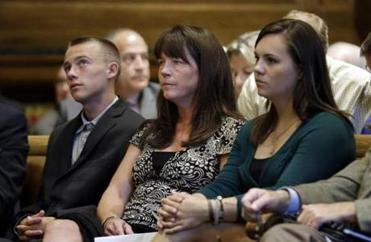 “It seems like a lot to me in that first trimester,” the state’s lawyer said. “Well, this is, what, six years ago?” McCleary responded from the witness stand. If the implication was that Kelsey and her family, not the state, had come up short, King County Superior Court Judge John Erlick wasn’t buying it. Three decades after a court first found that the state failed to amply fund education, he ruled in 2010 that Washington was still failing its children. “State funding is not ample, it is not stable, and it is not dependable,” Erlick wrote. Ahearne’s celebration was short-lived. The state promptly appealed the decision to the Washington Supreme Court. In June 2011, Ahearne stood before the Supreme Court justices and placed a large photograph on an easel. It was the infamous 1963 picture of then-Alabama governor George Wallace, standing in the door of a school, defying a court order to allow black children to enter. “Segregation now, segregation tomorrow, segregation forever,” Wallace had said at his inauguration. But the avalanche of data showing the impact of the state’s failure to fully fund education could not be ignored. Washington has one of the nation’s worst pupil-to-teacher ratios. It ranks 46th in percentage of high school graduates who go directly to college. (Only 48.3 percent do so, compared with 73.2 percent in Massachusetts, which ranks third.) And Washington ranks 40th in funding per pupil, at $9,436. This wasn’t just about rankings. Carter played on a regional soccer team and had met other players who went to wealthier school districts that offered courses unavailable in Chimacum. For example, no advanced placement course in computer science was offered — this in the home state of Microsoft. Only 51 of 709 public high schools in Washington offered such a course. Yet the need is great, with 20,000 unfilled computer jobs in the state. The Supreme Court upheld the lower court’s ruling, and again Stephanie McCleary believed her battle was over. Now it was up to the state’s politicians to come up with money. Just as the Supreme Court was trying to force the state to fulfill its education commitment, Governor Jay Inslee faced a separate crisis: Boeing, the state’s largest employer, with 80,000 workers, was threatening to move jobs out of state. It was an all-too-familiar quandary. South Carolina, for example, had given Boeing $900 million in tax breaks in 2009 to entice it to build a plant there. Many governors were offering the company huge incentives to move jobs from Washington to their states. In the end, after intensive lobbying by the company, Inslee signed a 2013 deal that provided Boeing with $8.7 billion in tax breaks through 2040, the largest ever granted to any company by a state. The deal was meant to ensure that Boeing built its new 777X plane in Washington. In recent months, however, Boeing has transferred 3,500 jobs to other states and plans for at least 2,000 more to be moved, reviving concerns about the tax deal. Rep. Reuven Carlyle in the Pacific Tower in Seattle, WA. 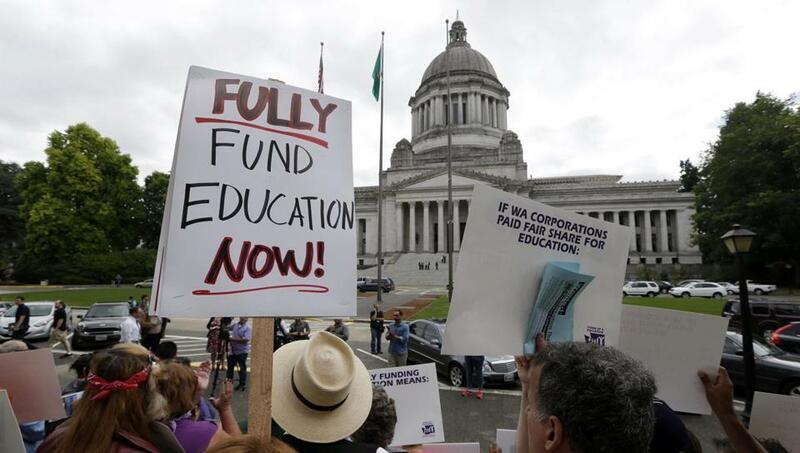 Inslee, a Democrat who got involved in politics as a parent concerned about funding for his children’s schools, said in an interview at his Capitol office in Olympia that he stood by the deal, convinced that it saved jobs and would pay off in the long run. Competition from other states forced his hand, he said. “Every single state is a potential victim of corporate extortion of jobs,” Inslee said. “We’ve certainly felt the sting here and we’d like to change that if we could.” He wants to see a deal between the states that would ban such bidding for corporate moves. “In a perfect world that someday may exist, taxpayers won’t get leveraged like that,” he said. 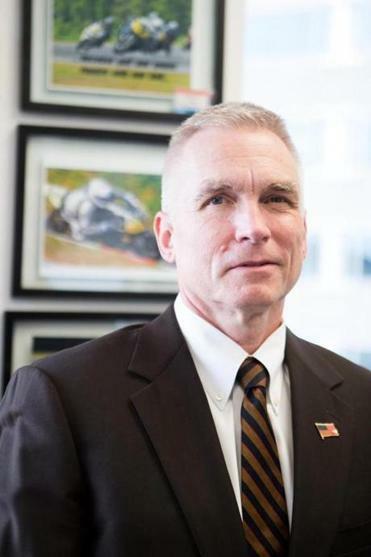 Boeing declined to make an official available for an on-the-record interview. The company said in a statement that the $8.7 billion in tax breaks would pay off for the state, citing a report that said the incentives, by fueling growth, would generate three times as much in state and local taxes over a 16-year period. As for the face-off between tax breaks and education funding, Boeing was dismissive. The billions for Boeing were given as the state struggled with the broader issue of tax inequities. Washington has the nation’s most unequal tax structure, according to a report by the nonpartisan Institute on Taxation & Economic Policy. The state’s poorest 20 percent of residents pay 16.8 percent of their income in state and local taxes, while the wealthiest 1 percent pays just 2.4 percent. With no personal or corporate income tax, Washington relies heavily on property and sales taxes, which are paid by individuals and businesses. A separate corporate levy, the Business and Occupation tax on receipts, has so many exclusions that many large companies pay little or nothing of the $3.1 billion collected under the tax. For instance, the state’s high-tech industry, including Microsoft, paid just $28 million in 2013 in Business and Occupation taxes, according to a legislative report. Microsoft declined to make an official available for an on-the-record interview. Instead, it provided a statement that noted that it agreed to a July deal that increased its tax liability, and it stressed that it pays significant other levies, including property and sales taxes. For comparison, that combined amount just slightly exceeded Microsoft CEO Satya Nadella’s pay package last year of $84 million, including future stock awards. The state’s agricultural, timber, and mining industries paid even less than high-tech – a combined $14.6 million. And the aerospace industry, which includes Boeing, paid $72 million in the Business and Occupation Tax. The McClearys, meanwhile, just wanted money for schools. They headed back to the Supreme Court after lawmakers failed to follow its ruling. “All rise,” the bailiff declared on Sept. 3, 2014, banging his gavel as the nine justices of the Supreme Court filed in. Ahearne could not rise on his own. Seven months earlier, he had been snowboarding at the 5,845-foot-high Stevens Pass ski area, 82 miles east of Seattle, testing his limits, trying to perfect an aerial flip. All day, he nearly stuck the landing. On his last try, he felt his feet land squarely, but then something else, an ungodly crunching sound. The next thing he remembered was the “thumpa-thumpa’’ of a rescue helicopter. Then the voices of emergency room doctors. He had shattered vertebrae and was told he would never walk again. Plaintiff Stephanie McCleary (center) sat with her children Kelsey (right) and Carter during a hearing before the state Supreme Court. Carter McCleary, 15 years old at the time, knew all this, and was heartbroken about it. He had become close to the lawyer, admiring the man he called “adventurous.” When the bailiff asked all to rise, Carter walked to Ahearne, who was in his wheelchair. Ahearne put his right arm around Carter’s shoulder, and Carter hoisted his lawyer to a standing position. As the bailiff banged his gavel’s final blow, the two stood as one, staring straight at the justices. Carter only had a couple of years left before he, like his sister, would go to college. Yet here he was, listening as the state’s lawyer argued that the politicians in the Capitol building across the street needed more time to fully fund education. When the state lawyer was finished, Ahearne rolled his wheelchair forward and addressed the justices, his voice dripping with derision. The justices, fed up with delays, sided with Ahearne and held the state in contempt of court, vowing to impose penalties if education wasn’t fully funded. Again, the McClearys hoped their long fight was over. But Democrats and Republicans couldn’t agree on how to respond. Inslee had proposed a capital gains tax on the state’s wealthiest residents, but Republicans blocked it. Unless they came up with at least partial funding, the government would shut down. One hour before the deadline, the Legislature came up with about $200 million, keeping the government open but failing to satisfy the Supreme Court’s demand for a long-term funding plan. The state has said it needs an extra $3.5 billion per two-year budget to meet the court ruling, while Ahearne said the figure is closer to $10 billion. With no definitive plan to pay for either amount, the court in August of this year ordered that the state be fined $100,000 per day until it comes up with an acceptable plan. It was a blow unprecedented in state history. While Democrats control the governorship and the House, Republicans narrowly control the Senate, giving them the ability to block Inslee’s plans. Republicans have argued the issue is about whether the state should pick up more of the tab now paid by school districts, not new taxes. The McCleary case “is being used as an argument for raising taxes because that is what Representative Carlyle and the governor want to do,” said former attorney general Rob McKenna, a Republican who lost the 2012 gubernatorial race to Inslee. McKenna is now a consultant to Microsoft, whose public relations staff arranged for him to be interviewed for this story. Inslee, who stressed that some demands of the court are being fulfilled and even exceeded, said he wants to fulfill the court’s order for more spending, but can’t say how that will happen. He has appointed a panel to study the matter. The voters, meanwhile, have sent the kind of mixed signals that are heard in many states as well as in presidential politics. In 2014, voters approved an initiative that called for new education spending, but then earlier this month, voters approved a separate initiative that makes it much harder for the Legislature to raise new tax revenues. Ahearne is incensed. In his view, the state has the money but is spending it elsewhere. Keep only essential tax breaks and abolish the rest, he says. That would yield more than enough money to fully fund education. The idea has gone nowhere. Three months after the Supreme Court started imposing the fine, Carter McCleary sat in his mother’s office at the school administration trailer in Chimacum, speaking of his dreams for future education. He is 16 years old, a high school junior. It has been a decade since he first reached up to shake Ahearne’s hand and his mother put the family name on the lawsuit. He speaks of a career in science. He is determined to do what his mother could not — graduate from college. After sitting patiently for 45 minutes for an interview, he excused himself to get back to his environmental science class. “I’ve got a test to take,” he said, and hurried out the door. 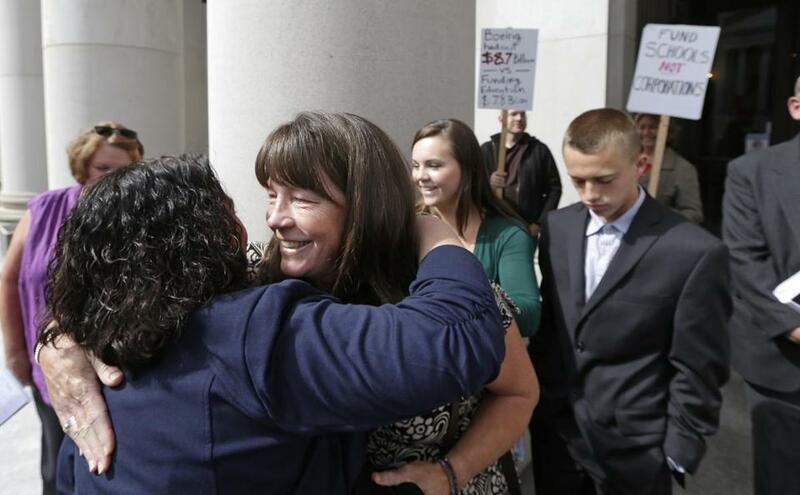 Stephanie McCleary was embraced outside the state Supreme Court. Michael Kranish can be reached at kranish@globe.com. Follow him on Twitter @GlobeKranish.